A CDB includes the root, the CDB seed, and PDBs. An application container is an optional component of a CDB that consists of an application root and all of the application PDBs associated with it. An application container stores data for one or more applications and shares application metadata and common data. The CDB seed, named PDB$SEED, is a template that you can use to create new PDBs. You cannot add objects to or modify objects in the CDB seed. A CDB has exactly one CDB seed. Each of these components is called a container. Therefore, the root is a container, the CDB seed is a container, and each PDB is a container. Each container has a unique container ID and name within a CDB. Figure 36-1 shows a CDB with several PDBs. An application container is a special type of PDB that has an application root that is separate from the root in its CDB, and it can have one or more PDBs. When a PDB belongs to an application root, it is referred to as an application PDB. An application root is a container to which application PDBs can belong. An application root belongs to its CDB root and shares descriptions of Oracle-supplied common objects in the CDB root. In addition, an application root enables you to create application common objects that are shared only by the application root and the application PDBs that belong to the application root. Application common objects are not visible to the CDB root, other application roots, or PDBs that do not belong to the application root. An application root cannot belong to another application root, and a PDB can belong to either no application roots or to only one application root. You can create an application seed for an application container. The application seed is optional, but, if it exists, you can use it to create application PDBs quickly that match the requirements of the application container. An application seed enables instant provisioning of application PDBs that are created from it. Description of "Figure 36-2 Application Containers in a CDB"
You can specify one or more application names for each application container, and each application name has an application version. For an application PDB that is not currently part of the application container, the names and versions of its applications determine whether it can be cloned to, plugged in to, or relocated to the application root. If an application container does not have an application name or application version specified, then only PDBs that also do not have them specified can be plugged into the application container. You can install an application in the application root. The installation can be script-driven or GUI driven, or a combination of the two. To use this method to install an application, run the ALTER PLUGGABLE DATABASE APPLICATION BEGIN INSTALL SQL statement before installing the application and the ALTER PLUGGABLE DATABASE APPLICATION END INSTALL SQL statement after installing the application. After the application is installed in the application root, you can install the application in application PDBs by synchronizing them. Each application container can have its own application common users, application roles, and application profiles, which can be created only when the current container is the application root. Application common users can connect or switch only to the application root in which they were created and to application PDBs that belong to the application root. Applications cannot be installed in a CDB root or in a PDB plugged into a CDB root. A multitenant environment enables you to achieve several goals. You can complete general tasks to configure and use a multitenant environment. After a CDB is created, it consists of the root and the CDB seed, as shown in Figure 36-3. The CDB root contains only Oracle maintained objects and data structures, and the CDB seed is a generic seed database for cloning purposes. 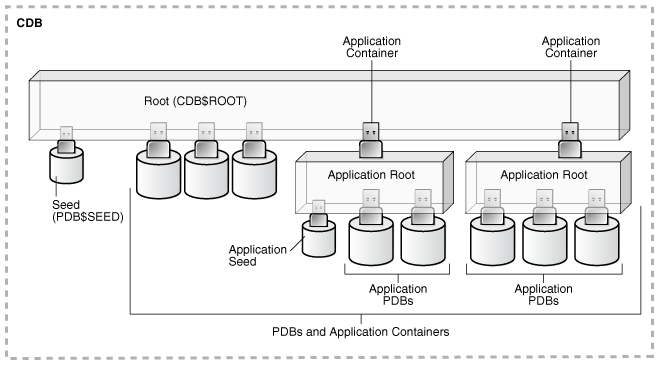 Description of "Figure 36-3 A Newly Created CDB"
An application container is an optional component of a CDB that consists of an application root and all of the application PDBs associated with it. An application container stores data for one or more applications. Figure 36-4 shows a CDB with one empty application container. Description of "Figure 36-4 An Application Container"
See "Creating and Removing PDBs with SQL*Plus" and "Creating and Removing PDBs with Cloud Control " for information about creating PDBs, plugging in PDBs, and unplugging PDBs. Figure 36-5 shows a CDB with several PDBs. Description of "Figure 36-5 A CDB with PDBs"
Figure 36-6 shows a CDB with PDBs, application containers, and application PDBs. Description of "Figure 36-6 A CDB with PDBs, Application Containers, and Application PDBs"
Administering and monitoring a CDB involves managing the entire CDB, the root, and some attributes of PDBs. Some management tasks are the same for CDBs and non-CDBs, and some are different. Administering and monitoring an application container is similar to administering and monitoring a CDB, but your actions only affect the application root and the application PDBs that are part of the application container. See "After Creating a CDB" for descriptions of tasks that are similar and tasks that are different. Also, see " Administering a CDB with SQL*Plus", " Administering CDBs and PDBs with Cloud Control", and " Viewing Information About CDBs and PDBs with SQL*Plus". You can use Oracle Resource Manager to allocate and manage resources among PDBs hosted in a CDB, and you can use it to allocate and manage resource use among user processes within a PDB. See " Using Oracle Resource Manager for PDBs with SQL*Plus". You can also use Oracle Scheduler to schedule jobs in a CDB and in individual PDBs. See " Using Oracle Scheduler with a CDB". Administering and monitoring a PDB or an application PDB is similar to administering and monitoring a non-CDB, but there are some differences. See " Administering CDBs and PDBs with Cloud Control", " Administering PDBs with SQL*Plus", and " Viewing Information About CDBs and PDBs with SQL*Plus". Oracle SQL Developer is a client application with a graphical user interface that enables you to configure a CDB, create PDBs, plug and unplug PDBs, modify the state of a PDB, clone a PDB to the Oracle Cloud, hot clone/refresh a PDB, relocate a PDB between application roots, and more. Additionally, Oracle SQL Developer has graphical interfaces for resource management, storage, security, configuration, and reporting of performance metrics on containers and pluggable databases in a CDB. EM Express is a management and monitoring tool with a graphical user interface which ships with Oracle Database. It can be configured for the CDB, individual hosted PDBs, or both. This tool is intended for PDB administrative use, in the context of the PDB, to manage and monitor application development as an application DBA. To access the application, click the Downloads tab, and select Oracle Pluggable Database Self-Service Provisioning application in the Downloads for Oracle Multitenent section.